Well Designed Wood Handle and Sleek Sturdy Blades The handles are made of wood incredibly sanded and shaped almost perfectly to fit in your hand comfortably for use. The manufacturing process of our palette knife is 100% handmade in a traditinal manner.Every CONDA Palette&Painting Knife is solid and sturdy and ideal for all oil and acrylic painting the creative possibilities of these knives is endless. Each blade is tempered and ground by hand for consistent flexibility and quality and firmly set in a hardwood handle. Designed holes in the handles make it convenient to hang them. The knives were labeled individually with a number, likely for identifying the types. ARTIST PALETTE KNIFE: 11 Piece Set includes 1-each of all 11 Standard Paint knife Styles.Every spatula has one individual package in case the entire safety.This high quality knife has been crafted with the finest stainless blade that resists all wear and corrosion from any media including acrylics. PALLET KNIVES: The diverse sizes and shapes open up a range of opportunities for applying paint to the canvas, shaping colors once they're applied, and mixing paints on the palette. These eleven knives range from fairly long (a couple of inches) to only slightly longer than thumbnail, letting people apply and shape as much color as you want. KNIFE PAINTING:Great assortment for Mixing, Spreading, Scumbling, Spreading, Scratching, Large Paintings, Murals, Theater work. 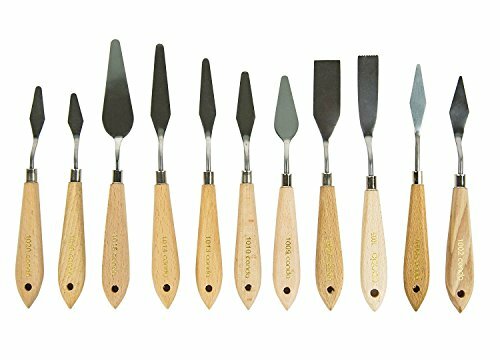 Perfect for professional artists, creative hobbyists, art students and art teachers, this full range of 11 traditional knives offers the right combination of stainless resilience and flexible spring to facilitate any painting application.Gesso, Paint, Modeling Paste & Texture Gels, Aggregates, Plaster. STURDY BLADES: These high quality knifes are crafted using finest stainless steel to resist corrosion from any media including acrylics. They are 100% handmade - each blade is tempered and ground by hand for consistent flexibility and quality. The handles are genuine hardwood firmly fixed to the stainless blades.Besides,the hardwood handles have an easy-to-grip design for increased comfort and grip. Quality Assurance：You won't risk a penny, we are so confident you'll love your sketchbook that if for any reason you are not fully satisfied, just return it within 365 days for a full refund, no questions asked. If you have any questions about this product by BlueField, contact us by completing and submitting the form below. If you are looking for a specif part number, please include it with your message.